8-Bit Girl: Happy Birthday, Shigeru Miyamoto! One of the most influential members of the gaming industry, Shigeru Miyamoto is responsible for some of the best-selling, critically acclaimed games of all time. 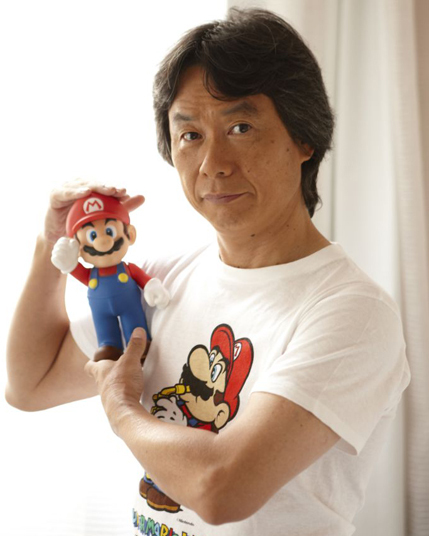 Joining Nintendo in 1977, Miyamoto helped to create the companies' most popular franchises, such as Super Mario, The Legend of Zelda, Star Fox, Pikmin and Donkey Kong. He can be credited for lending his creative vision to the companies' popular systems, such as the Wii, SNES, N64 and more. A true gaming legend, Shigeru Miyamoto now works for Nintendo as a 'Creative Fellow', a title given to him after Nintendo President Satoru Iwata's death. So, happy birthday Shigeru. Your games were credited as the reason I got into Nintendo as a kid, and I really thank you for that. He looks great. He may be 62, but in my mind he's immortal. This man is a legend.